A short visual novel I made for good luck. I wrote the script at 3 in the morning in bed when I couldn't sleep and spent all of the next day making it into a visual novel. 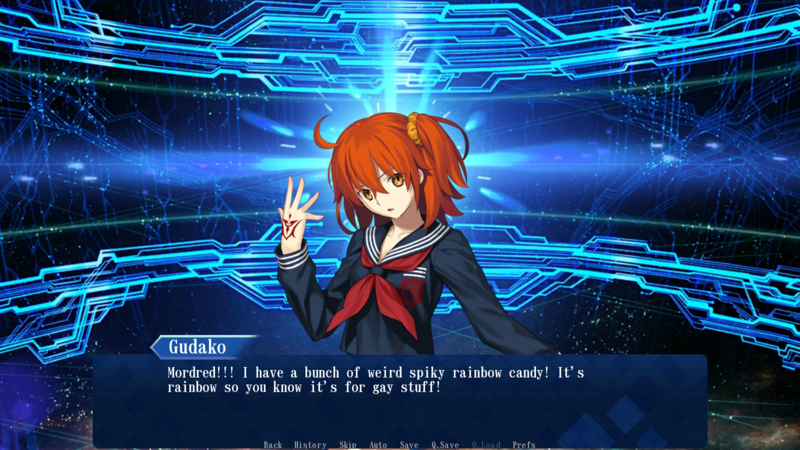 I'm addicted to Fate/Grand Order, please send help. All assets are from Fate/Grand Order. This is a fan project and a joke, please do not take any of this seriously. P.S. Mordred I love you so much please come home, I'm saving up all my quartz and tickets for your next rate up. 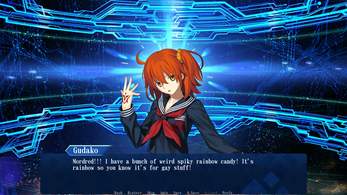 I expected this to just be a joke, but it was actually pretty good for a short game; there's hardly any Mordred x Gudako stuff out there, so I'm glad I found this. You're a good writer, you should make more of theses in the future! Thank you! That means a lot. I don't really have any more Fate writing, weirdly enough. I really love the series though, F/SN was a big influence on my writing as a teen, so it's something I'll try and do more of in the future when I have free time. I mostly just write and program original visual novels these days, but I really really miss making fan work stuff. Definitely more Mordred next time, I just wish they had a sprite with her red jacket because I'm gay.